Closed-Loop Solar Hot Water Heater: Pain or Gain? Closed-loop solar water heaters use a heat-transfer fluid to gather heat and a heat-exchanger to transfer the heat to household water. In the case of active closed-loop solar heaters, solar powered electric pumps, controllers and valves are also used to circulate the heat-transfer fluid which normally consists of glycol-water antifreeze mixture. The antifreeze mixture helps closed-loop solar water heaters to function effectively during freezing weather conditions. Yet another variation in closed-loop solar water heaters is the Drainback system where plain water is used in place of the glycol-water mixture. In this case, the water is forced through the collectors by a pump and thereafter drained by gravity to the storage tank and the heat exchanger. Here, there are no valves to fail and as soon as the pumps are switched off, the collectors become empty, ensuring freeze protection and auto shut-off when the water in the storage tank becomes much too hot. Although most popular brands usually provide good quality components for closed-loop solar water heaters, it may be prudent to check a few vital parts that are mentioned below. Controls, Circulators: The differential temperature controller monitors the temperatures at the solar collector outlet as also at the storage tank. When the collectors are warmer than the tank, the control turns on a circulator which circulates a heat-transfer fluid, usually water or a water-glycol mixture, through the collectors and back to the heat exchanger located in or adjacent to the storage tank. Heat Exchangers: The Heat Exchangers transfer heat from the water-glycol heat transfer fluid to the household water supply. Of course, these are nothing but a series of copper coils submerged in the water storage tank or in some cases in a compartment outside the storage tank. If physical inspection is not possible, detailed enquiries may be made about their quality. Also, inquiries should be made about the safety measures provided within the heaters and probable action to be taken in emergencies. 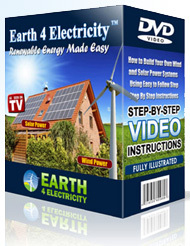 Do you want to know how to install solar panels? Yes you can set it up yourself and do the wiring too – all you need is some guidance. You need to know where to get the cheap batteries and parts from, and also have knowledge of the safety precautions. There are many advantages of solar power that include its eco-friendly nature and also the fact that it can save you a lot of money on your electricity bills. So opt for solar power today – to light up the rooms and also for heating purposes.